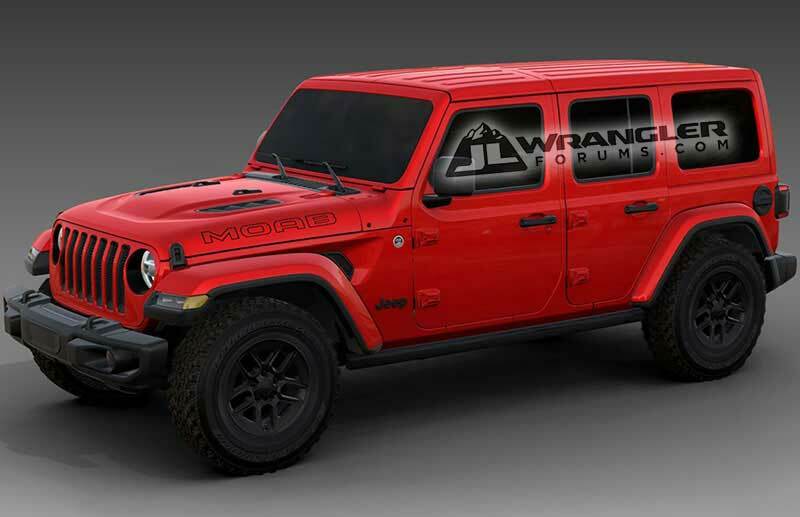 A couple of weeks back an image turned up that showed a JL Wrangler on a car carrier wearing a MOAB sticker on the hood. A newly leaked document purports to include content and pricing information about the Moab edition. If the document is right, it’s not going to be a cheap Jeep. According to the document spotted on the JL Wrangler Forums, the Moab is based on the 4-door Sahara trim, and while there are no mentions of upgraded axles and such, it does get the Selec-Trac full-time 4WD transfer case and the 3.6L ESS 8-speed automatic powertrain, a limited-slip diff, steel Mopar rock rails, a steel front bumper, and front and rear black tow hooks. It also gets the dual vented hood from the Rubicon, low gloss black 17-inch Rubicon wheels, LED lighting, leather seats, premium Alpine audio, and a body color hardtop. 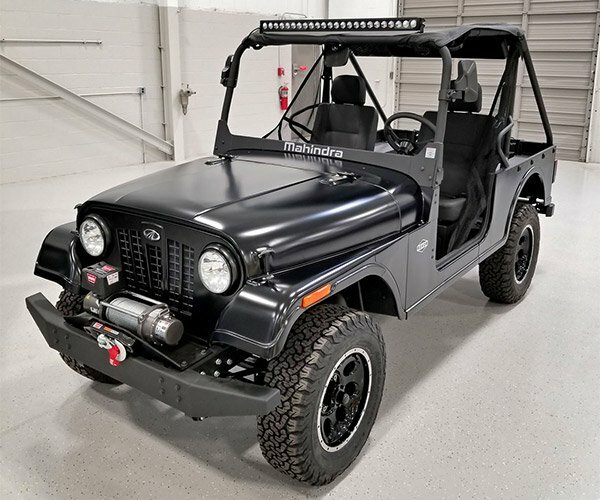 Options include a 21.5-gallon fuel tank, Sky one-touch power top, cold weather group, trailer tow and HD electrical group, and lots of Mopar add-ons including a hinge-gate reinforcement to carry larger wheels and tires. The Moab reportedly starts at $51,200 plus a $1,495 destination charge. 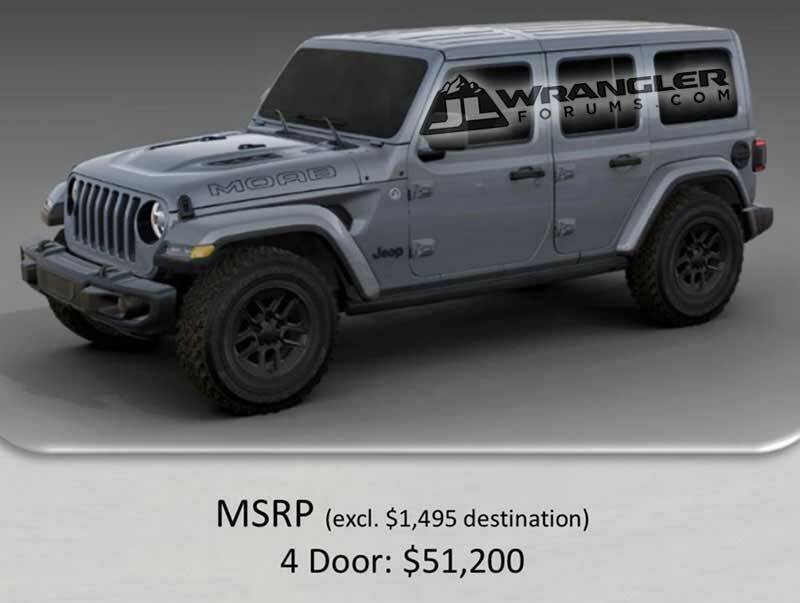 That’s a kick in the stones for JK fans used to paying under $50k for the high-end versions, but the JL Wrangler does make a whole lot of improvements over the prior generation, so the cost is likely justified.